The dubiously-titled Clean Indoor Air Act of 2007 would place the entire (OK, it’s not that big, but it’s still a state) Old Line State in the freedom-squelching ranks of sixteen other states, not to mention over 250 local governments, who have already adopted fascist smoking bans. Five Maryland counties – Howard, Charles, Prince George’s, Montgomery, and Talbot, for those of you keeping score at home – currently have their own bans in place. And the Baltimore City Council is currently considering a city-wide ban, which they may vote on by the end of this month. 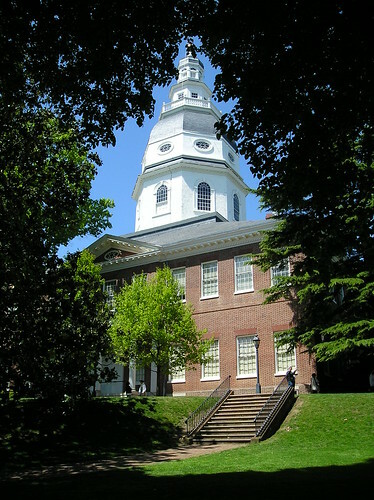 This is the third time Annapolis has tried to pass through a statewide ban. While nothing is certain, those in favor of controlling the actions of consenting adults and violating the property rights of business owners are not-so-cautiously optimistic. Will this bill pass? “Absolutely,” says Delegate Barbara Frush. Sadly, even if the ban does not pass this year, a quick look at the overly intrusive policies of Maryland’s government suggest it will sooner or later. My advice to Marylanders? For now, smoke ‘em while you’ve got ‘em. Once the ban passes, I’ll be happy to have a drink and a cigar with you in The Commonwealth. I don't know if you all noticed, but — up until today's post — StogieGuys.com went more than a full week without mentioning smoking bans. These paternalistic laws can be a bit depressing. But, let's face it, when you write about cigars seven days a week, it's hard to not mention them. I did notice, and it was nice! Until I started reading StogieGuys I didn't hear much about smoking bans, except occasionally from Cigar Dave. Reading the posts here has got me scared, but maybe that's a good thing. Like you said – it's a bummer to read about but it's certainly necessary to shed the light; lest one day even us Virginians will wake up to smoking bans and not even know it! I hope you guys all got a chance to celebrate "Ash" Wednesday properly. I don't know about you, but I bundled up and headed outside with a nice robusto. So is there actually a religious tie-in, or what? Not to depress my fellow MD citizens even more, not only does the State Wide smoking ban have a good chance of passing this year but also a nice 25% increase in tobacco tax is on the horizon as well to help pay for new programs. Question though, who will pay for these new programs when people stop buying their smokes in MD? Oh yeah, the difference will need to be made up by non-smokers. So please don't let non-smokers take the attitude of "I don't smoke, it doesn't affect me" cause when smokers take their business elsewhere, the money to fund these new programs will come from someplace else.